Which are your favorite Whitney Houston's songs? The playlist below contains some of my favorite ones. Some such as "One Moment in Time," "Step by Step," "The Greatest Love Of All," and " I Didn't Know My Own Strength" encourage and inspire me to keep on keeping on. Others such as "I Wanna Dance With Somebody" just make you want to get up and dance! So many beautiful, powerful, inspiring songs. 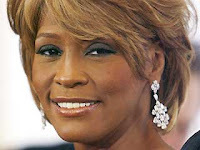 Rest in peace, Whitney. The gift of you, your voice, your uplifting songs and lyrics will remain with us for years to come. Thank you.